Wash and dry Napa cabbage leaves, then cut into 1 1/2-2 inch pieces (rectangular or diamond-shaped). Place in a large container and layer with kosher salt. Let sit for approximately 2-6 hours. In the meantime, blend the apple, garlic, ginger, and white part of the onions in a cup blender with a very small amount of water. You want to create a thick sauce. 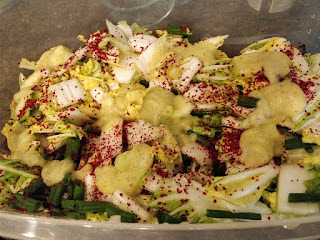 Refrigerate the sauce until the cabbage leaves are wilted, rinsed, and drained well. Cut the remaining green onions (the green ends) into 1 1/2 inch-long pieces and refrigerate as well. After the cabbage is wilted, do a quick cold water rinse on the leaves and drain well. You want some of the salt to remain for the fermenting process. Pour the sauce over the wilted cabbage and the green ends of the green onions. Add as much gochugaru as you like. 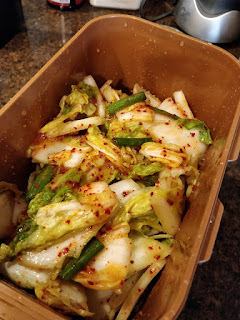 I like my kimchi mild, so I don't use a ton of it. Put disposable plastic gloves on and gently mix the sauce and chili flakes into the cabbage and green onion pieces, moving them around until all pieces have been coated. Place seasoned cabbage in kimchi box or in a sanitized Mason jar (leave about 1/2 inch empty at the top), pressing down with kimchi box seal or fist (if using a Mason jar) to remove all air. Cover with top and leave in a dark place (like a pantry) for at least 2-3 days. Then, refrigerate.